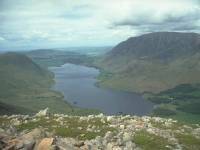 A second attempt at the High Stile range, eight years after the first, was no more successful than the original as far as photography was concerned. We did get a few photos from Dodd, Red Pikes's northern outlier, but little else of note. The final 500 ft of Red Pike's ascent route was a nasty scramble (we missed the correct path) and the descent from High Crag via Gamlin End was a nightmare of steep, loose scree. 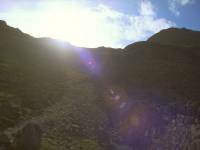 I didn't touch the High Stile group again until May 2000, a walk that had to be aborted on Red Pike because of unforecast rain and hill fog. We've climbed out of Buttermere by the usual route via Burntness Wood and Bleaberry Tarn. This is the view from Dodd, Red Pike's northern outlier, about 2000ft above sea level. 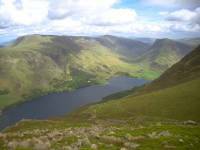 Crummock Water from Dodd. Loweswater is seen beyond. Grasmoor is the fell to the right. Looking northeast from Dodd over Buttermere and into Honister Hause beyond. Robinson lies to the north of the lake (left of shot), while the cone of Fleetwith Pike is prominent to the right. 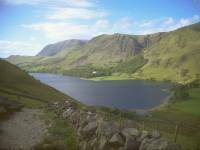 The village nestles within the small area of flat gound between Buttermere and Crummock. Knott Rigg appears above the Newlands valley, with Whiteless Pike to the left and Robinson to the right. 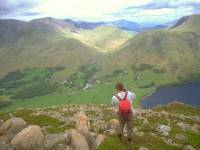 The climb to Red Pike is tough, but the ridge walk to High Stile (2644ft) is simple. 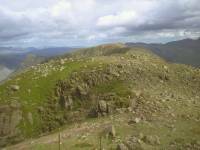 The ridge beyond High Stile leads to High Crag, then down the steep scree slope of Gamlin End. 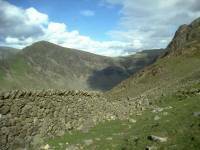 We've stopped at the drystone wall above Scarth Gap, the path between High Crag and Haystacks. Looking up into the sun from the same spot. 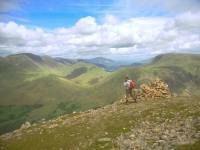 Descending the Scarth Gap path. Buttermere always looks lovely from here.